Top Ten Tuesday is a weekly feature hosted by Jana at That Artsy Reader Girl. 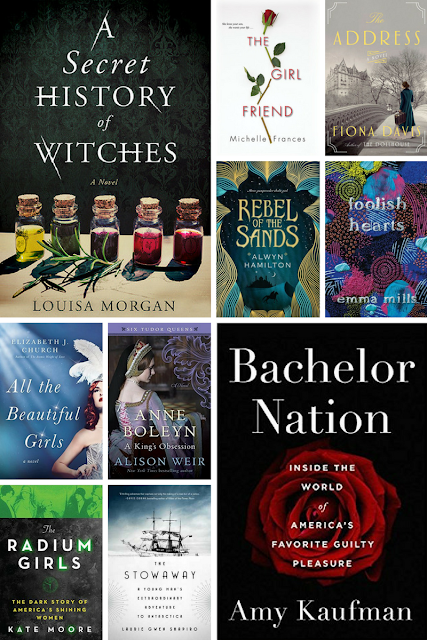 This week's topic is our spring TBR. Since I've been adding so much nonfiction to my TBR lately, my list has basically been exploding and I have so much to catch up on! Here are just some of the books I'm hoping to finally get to this spring. Any suggestions for where I should start? Awesome list!!! A few of these are on my TBR, I can't wait to see what you think! Yeah, that one's been hanging around my TBR for awhile! I’ve heard good things about The Radium Girls. I’m on the fence about reading it because I already know the story. I hope you love all these! I don't know too much about the story, so I'm hoping to learn more! The previous novel about Katherine of Aragon was good, so I have high hopes for the Anne Boleyn one! Okay, your list just reminded me that I have the ARC of The Radium Girls since last year and I still haven't read it! I don't know why but hope to read it soon. Haha, I know! Too many books! Hope you love Foolish Hearts!! Loved that one. Radium Girls is one I am curious about. Hope you enjoy these!! Thanks, Grace! I'm hoping to do an Emma Mills mini-binge! Awesome list, I see so many on here that I've been really wanting to read! Actually, I'm pretty sure all of these are books I'm hoping to read--I really hope you get to them and enjoy them! I'm particularly excited for Radium Girls, The Stowaway, and Anne Boleyn. Great list! Thank you, Jordan! Can't wait to hear what you think of these! Rebel of the Sands! I'm hoping to start that series sometime soon too :) And Anne Boleyn sounds intriguing, I am definitely always interested in Tudor history. I am pretty much obsessed with the Tudors! I've got a couple of these on my TBR too! And am hearing really good things about a couple more of them. Nice list! Ooh fun stuff! Seems like I saw a good review for Radium Girls- that one seems familiar- and The Girlfriend looks good too, just going off the cover. Hope these are all great! Thanks! I tried to get a good mix of genres in there. Oooh, I'm intrigued by A Secret History of Witches. Hope you enjoy all the books on your TBR! Yes, that one definitely sounds interesting! Quite a few of these are still on my TBR so I can't wait to see what you think of them. SQUEEEE! Foolish Hearts is so wonderful! I hope you love it as much as I did. All the Beautiful Girls and Radium Girls are on my radar (hey, what's with all the girls? XP) They both sound really interesting. I know, I can't believe I've put off Foolish Hearts for so long! Seriously, why is it always "girls"? So excited to see Rebel on your list! I need to know all the things when you read it! The third book was amazing and my first real (not a reread) 5 star of the year! Awesome! You are the reason I have Rebel on my TBR! Awesome list! Some of these books are new to me, so I will have to check them out. I can't wait to hear your thoughts on Bachelor Nation - definitely sounds like a fun book! Foolish Hearts is definitely one I am interested in. I love Emma Mills's writing style. I know, I'm kind of obsessed with reality tv, so Bachelor Nation is definitely high on my list! Sweet books-I hope you get to enjoy them!! Goodness, I am loving the cover of a Secret History of Witches! Me, too! I'm going to try that one this week. A Secret History of Witches sounds cool! It does, I'll be starting that one soon! I had no idea Bachelor Nation was a book...and I must have it!! I got into watching the Bachelor shows ever since Jojo's season of the Bachelorette, and have been actively watching since. Like the title says, it's my guilty pleasure!! Awesome, I hope you enjoy it! I don't watch The Bachelor, but I love reality tv! I still need to read rebel of the sands. Great list.